Ruddell, D., and Foster, K. (2018). GIS&T and Geodesign. The Geographic Information Science & Technology Body of Knowledge (3rd Quarter 2018 Edition), John P. Wilson (Ed). DOI: 10.22224/gistbok/2018.3.3. This entry was first published on September 12, 2018. No earlier editions exist. Acknowledgements: Authors would like to thank Hrishi Ballal, Brian Sims, Haoshi Wang, and workshop participants. Geodesign - geodesign is a method which tightly couples the creation of design proposals with impacts simulations informed by geographic contexts and systems thinking and supported by digital technology. (Flaxman 2010). Collaborative - geodesign is a mode of creative problem solving, which is rarely the domain of a lone thinker – most of the world’s important innovations emerged out of team work. Bringing together diverse ideas, from multiple perspectives, results in richer, more inspired solutions. Collaboration occurs when more than one person or organization work together to achieve a goal. Systems thinking - A holistic approach to set of elements or parts that is coherently organized and interconnected in a pattern or structure that produces a characteristic set of behaviors. Stakeholder engagement - Various individuals, groups, officials and/or organizations who have an interest in the geodesign process outcome comprise the stakeholders. Effective engagement ensures the voices and needs of all stakeholders are accounted for and enables stakeholders to be better able to evaluate how proposed changes will impact their interests or circumstances. The term geodesign has been associated with GIS&T and in increasing use since it was coined in 2005 by Jack Dangermond, President and Co-founder of Esri (Miller 2012). Though the term itself is relatively new, the intellectual concepts and techniques associated with geodesign are rooted in decades of research and practice beginning in the 1960s. Ian McHarg, at Penn, and Phil Lewis, at Wisconsin, were landscape architecture professors and practitioners at the forefront of using land information for planning and design. Harvard’s Computer Graphics Laboratory provided early implementation of these concepts into digital tools (Foster 2016a, Wilson 2015). These pioneers were early adopters of integrating environmental science, both analog and digital, as key aspects of the landscape design process (Tulloch 2013). Geodesign is a contemporary application of creative problem solving for land-based design and planning challenges that now includes dynamic, digital GIS&T and interactive collaboration. Bill Miller, former Director of Geodesign at Esri, a leading GIS software company, asserts that geodesign is the third stage in how Geographic Information Systems have evolved. There are many ways that geodesign has been defined. Flaxman (2010) and McElvaney (2013) are often cited as they provide explanations that cover four central tenets of geodesign, namely: it is a design process, it incorporates geospatial data and science, the process engages stakeholders, and dynamic digital technology aids in bringing all of this together (Foster 2016). To permit these four central tenets to easily coexist a structured framework is needed that enables fluidity without sacrificing organization (Foster 2016). This is what the Framework for Geodesign outlined by Steintiz provides (2012). The Geodesign Framework is rooted in six fundamental questions. Three are questions about a place’s past and the present, and three questions about the future. How should the state of the place be described? How does the place work/ operate? Is the place currently working/ operating well? How might the place be altered or changed? What differences might the change cause? How should the place be changed? The method for addressing these questions are called “models.” Steinitz outlines six models that form his Framework. The framework process requires cycling through these questions (models) three times, with a slightly different perspective in each iteration (Steinitz 2012). All answers relate to each other and build upon the previous question – therefore each answer contributes to the next question (model) (Figure 1). The models are also “paired” based on their “root” – for example both the Evaluation and Decision models require knowledge of stakeholders or professional team members. 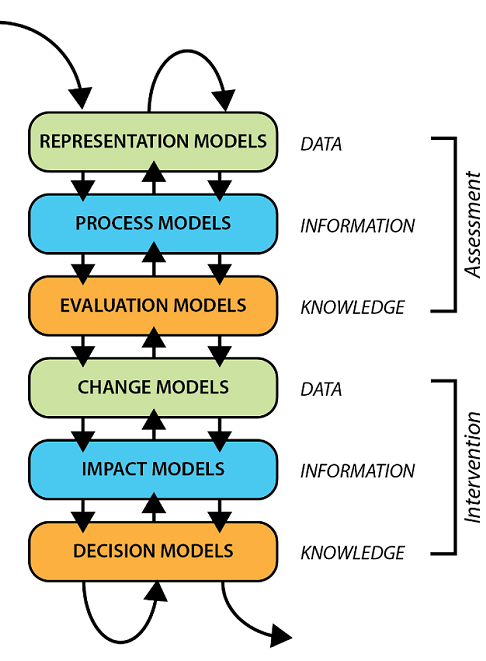 The Representation and Change models are rooted in data, and the Process and Impact models work with that data to provide information (which can then be “acted” on via the Evaluation and Decision models). Steinitz’s geodesign process enables the framing of culture, place, and problems into understandable models. Each model is essentially attempting to communicate an important idea about suitability. Whether it is the soil, pedestrian safety, or future land uses - each bit of information is a clue to understanding what creative change may be best for that place. Thus, the geodesign framework is a tool that establishes a process to think critically about places and cultures, and how to promote resilient, sustainable, and equitable living environments. Figure 1. Geodesign Framework. Goldberg, D. (2017) Adapted from Steinitz (2012). The first pass through the six models is the “Why” iteration: Why are you worried about the place or the issue? Why should this project be done? Gaining a thorough understanding of the problem is key to the future success of the process. For the second pass through the framework, the questions (and models) are taken in reverse order. Steinitz refers to this as the “How” iteration of the Framework: How will the project be organized and run? This pass through the framework is focused on setting up detailed guidance on how to approach the creation of design solutions. This “How iteration” establishes the methodology for doing this particular geodesign application – which is then implemented during the third pass through the models. As these are often complex challenges, the process recognizes that there may not be a final accepted design solution the first time through the framework – sometimes things need to be re-examined at a different scale, or new people or information require circling back to an earlier point in the process. This framework assists in devising solutions befitting the place and the community’s values which are rooted in a decision-driven, data-informed design process. Though not labelled specifically as “geodesign,” there are other, similar frameworks for land use design and planning that include most of the four central tenets that characterize geodesign for this paper. Two prominent examples are Carr and Zwick’s LUIS: Land-Use Conflict Identification Strategy (2007), and the Sustainable Systems Integration Model (SSIM™) by the multi-national design and engineering firm AECOM (Sofian et al 2015). 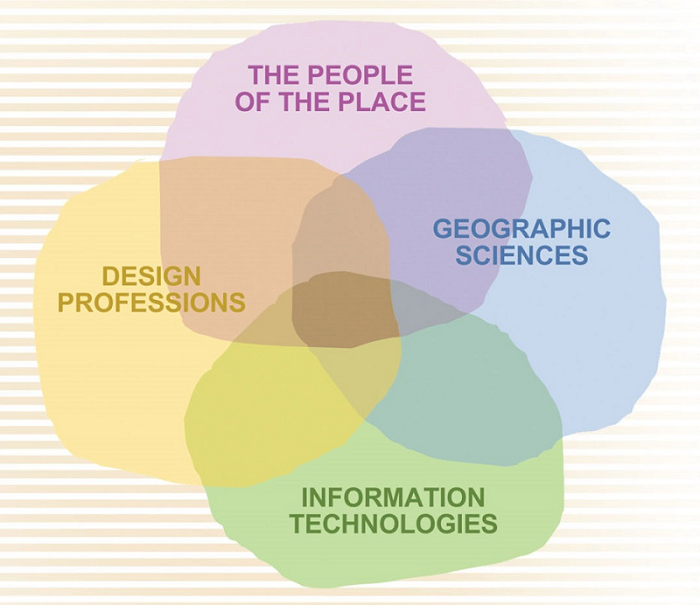 Steinitz portrayed geodesign as a Venn Diagram on the cover of his book (2012). [Figure 2] Essential to this portrayal is that geodesign is a multidisciplinary, collaborative process. It is process that fills the gap between science and design -- both the GIS&T and the design perspectives are crucial to moving towards more sustainable solutions for the land and for communities. Steinitz advocates that effective collaboration throughout the geodesign process must involve these groups: “(a) the people-of-the-place, (b) design professionals, (c) geographic scientists, and (d) information technologists” (McElvaney 2014). Innovation nearly always comes from collaboration—bringing diverse ideas together can illuminate creative solutions to tough challenges. As part of the geodesign framework models, decision-makers establish metrics for the desired performance of the design. Computation, such as comparing factors, is used to reveal the consequences of various actions. This “measuring performance” computation step is one of the unique and distinguishing features of geodesign. And in particular, the ability to calculate and compare feedback on various intervention strategies in real-time is extremely valuable for engaging stakeholders in recognizing that different choices can have different impacts on their desired goals. Once the basic geodesign framework process is understood, including what questions to ask when, it can be seen to be applicable at many scales and for a variety of issues. Geodesign can effectively address complex environmental design problems for situations ranging from resilient urban design at neighborhood scales to conservation planning at national and international scales. Methodology: low to high technology solutions. The following case study from Los Angeles, California illustrates a collaborative and on-going engagement effort that uses the geodesign framework. Located just north of downtown Los Angeles, the Taylor Yard River Park (G2 Parcel) was purchased by the City of Los Angeles in March 2017 as part of a larger effort to restore and revitalize the Los Angeles River. The Taylor Yard site covers nearly 250 acres of land along the Los Angeles River which was historically used for rail maintenance and fueling by the Union Pacific Railroad Company. The Taylor Yard River Park Geodesign Project took place in January 2018 as a joint effort between the City of Los Angeles, the University of Southern California, and Geodesignhub (Geodesignhub.com) to organize and deliver a geodesign workshop to explore alternative design scenarios to promote human and ecological health of the Los Angeles River and Taylor Yard site in Los Angeles. Created by Hrishi Ballal in 2014, Geodesignhub is an online tool that leverages the geodesign framework while facilitating discussions and negotiations on the future of a place. Demonstrate the power of geodesign methods and tools to address real world problems. The Taylor Yard River Park Geodesign Workshop assembled 18 individuals – comprised of students, professionals, and stakeholders – to participate in a one-day workshop to create alternative design scenarios by discussing and identifying priorities and restrictions of the site. The workshop featured interactive break-out groups and concluded with a negotiation among participants to create a single collaborative design plan for the site. Workshop participants included: community representatives from Cypress Park, representatives from the City of Los Angeles, representatives of LA River Revitalization, environmental conservationists, landscape architects, urban planners, USC Geodesign students, and Esri technicians. 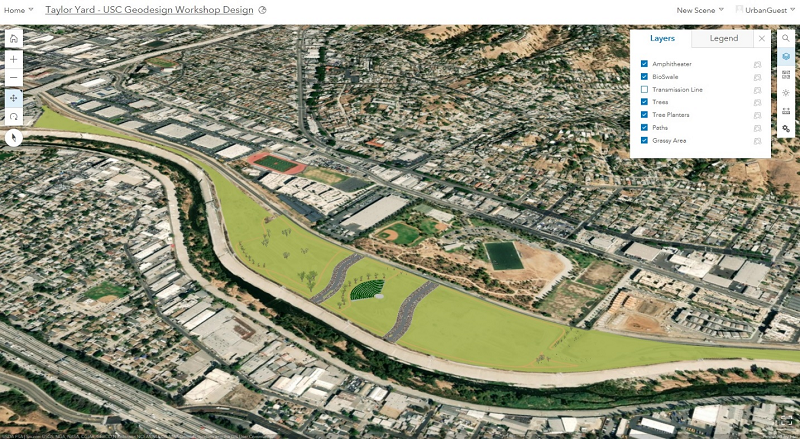 The Taylor Yard site provided an ideal study context to demonstrate the value of contemporary digital geodesign tools to help the City of Los Angeles achieve valuable outreach and citizen engagement goals in the restoration and revitalization of the Los Angeles River. The workshop brought together diverse stakeholder groups and utilized spatially explicit negotiation tools available in the Geodesignhub software platform to facilitate discussions and produce viable design alternatives for the Taylor Yard River Park site. The project necessitated that design solutions consider complex urban and environmental challenges. Evaluation maps were created for each system to use in Geodesignhub and rankings were applied to each system (e.g., existing, not appropriate, capable, suitable, feasible). The final collaborative design (Figure 3) reflects the four central tenets of geodesign, that is: the design process, incorporating geospatial data, stakeholder engagement, and synthesis using dynamic digital technology. After the workshop, the final negotiated design for the Taylor Yard River Park was then rendered into a dynamic 3D simulation model using Esri’s ArcGIS Urban software program (Figure 4). This next phase of the project is to present the digital renderings of the design alternative to local stakeholders and city officials and engage in an advanced discussion on the future of the Taylor Yard site. Figure 3: Final Negotiated Design from the Taylor Yard River Park Geodesign Workshop Using Geodesignhub Software Platform. Figure 4: 3D Rendering of the Final Negotiated Design of the Taylor Yard River Park Using ArcGIS Urban. Carr, M. H., & Zwick, P. D. (2007). Smart land-use analysis: the LUCIS model land-use conflict identification strategy. ESRI, Inc..
Goldberg, D. (2017). Geodesign: The Synergy of People, Processes & Place. In presentation at PA/ DE American Society of Landscape Architects (ASLA) Conference, Wilmington, DE, April. Lee, D. J., E. Dias, and H. J. Scholten (Eds). (2014). Geodesign by Integrating Design and Geospatial Sciences. Springer. McElvaney, L. A., & Foster, K. (2014). Enhancing Stakeholder Engagement: Understanding Organizational Change Principles for Geodesign Professionals. In Geodesign by Integrating Design and Geospatial Sciences (pp. 315-329). Springer, Cham. McElvaney, S. (2012). Geodesign: Case Studies in Regional and Urban Planning. Redlands, CA: Esri Press. McElvaney, S. (2013). Geodesign - Strategies for Urban Planning. In Paper presented at American Planning Association (APA) National Conference, Chicago, IL, April. McHarg, I. (1969). Design with Nature. New York, NY: Doubleday Books. Miller, W. R. (2012). Introducing Geodesign: The Concept. Redlands, CA: Esri Press. Steinitz, C. (2012). A Framework for Geodesign: Changing Geography by Design. Redlands, CA: Esri Press. Define geodesign and describe how it contributes to GIS&T. Describe the four essential groups of people that are needed for a collaborative geodesign project. Describe the opportunities that might be possible in land planning and design practices through deploying the geodesign process. What are two advantages and two disadvantages of using the geodesign framework? How does size and scale of a given project impact the geodesign workflow? How does geodesign provide value in taking on complex land-based challenges and finding geographically specific, adaptive and resilient solutions?